What Do Your Toes Say About You? What Do Your Foot Shape Say About You? Palmistry, the art of reading palms to tell about your destiny, is there for centuries. For some it is hard to believe that lines on your hands can tell something about your personality and future. It is even harder to believe that some parts of the foot can also reveal interesting facts about your personality. The shape and length of your toes can tell a lot about your personality. While you may want to take it with a pinch of salt, you may still want to give it a shot and see how correct the readings are. Having a longer big toe as compared to other toes makes you a clever, creative thinker. It means you are capable of finding ingenuous solutions to different problems. You have the ability to see things from different perspectives. The negative thing is that you may find it difficult to maintain your focus for long and this often makes you leave your projects incomplete. If your big toe is comparatively short, it means you love multi-tasking and know how to make people work in a team. The second toe on your right foot reveals more about what you want in life. It touches the floor if you are getting what you want. If there is a gap between your second and third toes, it usually means you are not getting exactly what you want in life. This also tells that you find it difficult to separate yourself from your emotions. The length of your second toe also tells about your leadership qualities. You are more likely to lead when your second toe is long. It also tells that you are resourceful but want things done in your way. A smaller second toe usually indicates you value harmony and do not push yourself hard through situations. What do your toes say about you? Your third toe has a lot to say. Having a longer third toe means that you have serious energy and are quite resourceful at work. The Chinese believe the third toe is associated with drive, energy, and willpower. If it is long, you are a perfectionist and also have determination to achieve your goals. The downside is that you may always give work more priority over your family and other things in life. A shorter third toe usually means you love relaxing and enjoy the pleasures in life. 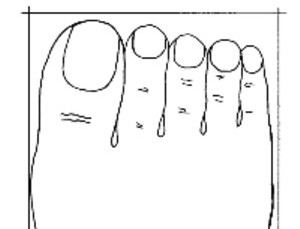 This toe is associated with relationships. If it is straight and long, you give your family a great importance. A short fourth toe usually means your focus is not on your relationships and family. If it is curled, it shows problems in your relationships. You will also have a hard time cutting yourself off from other people's problems. People with clawed toes should learn to relax and let go of things or they may have to deal with certain health problems. Childlike impishness is in your personality if you have a small little toe. It also indicates that you get bored easily and usually shy away from responsibility. Your focus is more on looking for amusing diversions. This characteristic makes you quite sociable and witty too. You are more likely to be an impulsive, charming flirt if you can separate your little toe easily from your fourth toe. Now that you know the answer to your question, "What do your toes say about you?" you may also find it interesting to learn what your foot shape says about your personality. You are likely to have this type of feet when you have a well-proportioned body shape. This usually indicates a sociable and outgoing personality. You are always in a mood to learn new things and are open to new experiences. People with this foot shape are usually travelers and love to explore new places. When your second toe is relatively longer as compared to the rest of the toes, you have a Greek foot or fire foot. It usually indicates that you are an active person. You love sports and are creative as well. You are always enthusiastic about new ideas and love trying new things. Your passion makes you a motivation for people around you. The downside is that you may sometimes be very impulsive that can make you deal with excessive stress. When the length of your toes is the same, you fall in this category. Your foot will have a rectangular shape. It usually indicates that you think a lot before taking any step and examine your decisions relentlessly. You have balanced mind and usually weigh up the positive and negative before taking the plunge. This characteristic makes you a reliable and very practical person. When you have an elongated, tight shape foot, it usually means you keep things private. You will have your toes fused together with your big toe slightly tapered toward the top. It also belongs to folks who have hidden depths. If you fall in this category, you may agree to the fact that you are quite impulsive and your mood changes quite quickly. Server responsed at: 04/25/2019 2:22 p.m.